Targeting medical equipment such as defibrillators as well as ECG diagnostics and monitoring systems, the MAX30034 defibrillation protection device from Maxim Integrated Products, Inc. protects against defibrillation pulses and electrostatic discharge (ESD). Compared to existing approaches and components, it simplifies design, provides >75% space savings, and trims the bill of materials, all while significantly improving performance. Designers of defibrillators and ECG monitors face a challenge, as their ECG input amplifiers must withstand high-voltage pulses for cardiac resuscitation. These pulses can easily damage the sensitive electronic circuitry which captures the millivolt level heart signals. Preventing this damage has required a three-layer, multi-component approach combining a per-channel gas-discharge tube (GDT) and/or transient-voltage suppression (TVS) device, as well as ESD-protection diodes. Further, leakage current (a critical parameter) is relatively high, at about 1-2nA. 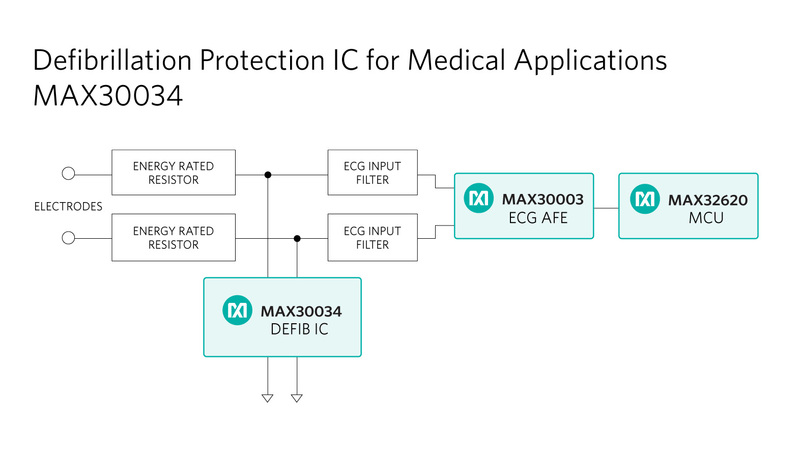 Maxim’s four-channel MAX30034 defibrillation protection device uses an innovative topology from an advanced semiconductor process to absorb and harmlessly redirect these high-energy pulses away from sensitive circuitry. This small and robust device needs only two external pairs of resistors for each channel to provide design simplicity, smaller overall size, and lower leakage current. The MAX30034 replaces the primary-level GDTs and/or TVSs, as well as secondary-level ESD diodes which are the conventional solutions for mandated circuit protection. The device can withstand over 100,000 defibrillation pulses without failure and still maintain a leakage current under 10pA (100x less than GDT/TVS-based approaches).